I just finished up my first vintage sewing project of the year! Hooray! I’m not sure how the weather is by you, but here in the San Diego area it’s been quite warm for this time of year! 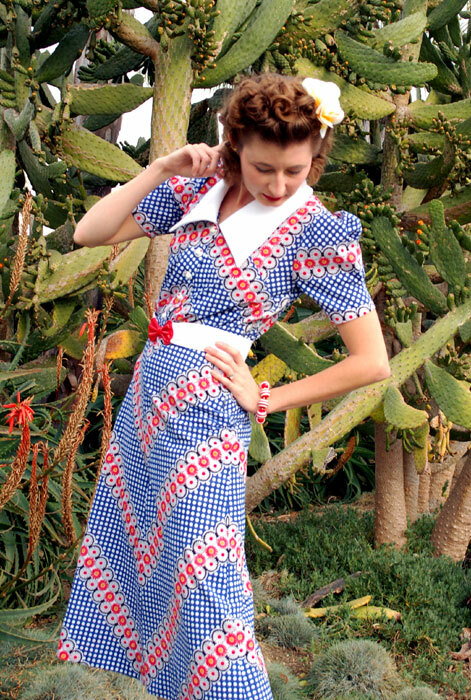 It gets my sewing inspiration all messed up- I go back and forth between wanting 1910s costumes and pretty coats to craving 1930’s and 40’s cheerful dresses and beachwear. Since I needed to order grommets for my 1910s corset was in the process of waiting for them in the mail, I took the excuse to delve into a little vintage project. 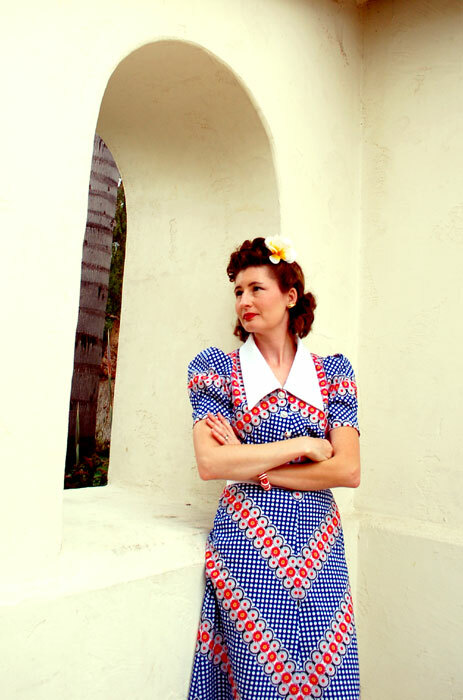 I made this dress from a vintage pattern, Hollywood 1558, from 1938. I even found the pattern pictured in a 1938 Ladies Home Journal magazine! This was an instance of fabric first, pattern second, however. 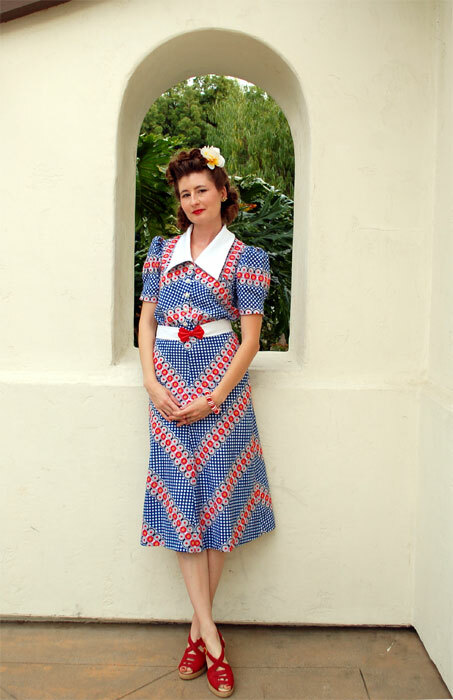 I found this wild print in the Los Angeles garment district and KNEW I had to make a very loud dress, similar to those I posted about quite a while ago as shown in a 1938 catalog. The fabric is a lightweight cotton and but collar and belt are made of white cotton pique. 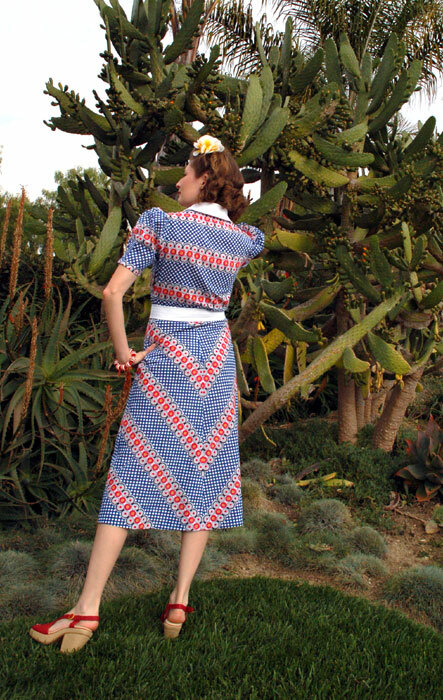 This dress was very cleverly designed to have fabric cut on the straight of grain, crossgrain, and bias in order to play with the direction of stripes. I actually cut the back piece on crossgrain instead of grain because I wanted my pattern to line up with the sleeve. I think this was one of the instances where cutting the dress out took almost as much time as sewing, but for a print like this I knew it would be ideal! I used vintage buttons that are little novelty ones that look like hats and a vintage buckle. 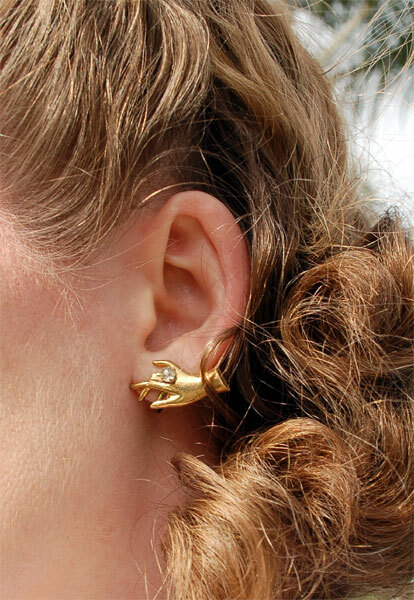 My shoes were by Farylrobin (purchased on Amazon) and my bracelet was bought many years ago from Forever 21, but I was excited to be able to wear these vintage novelty screw back earrings I just picked up at an estate sale. They remind me so much of one of Adrian’s designs for a bathing suit in The Women! Actually, I’m not sure why my hair looks so dark and red in the other photos (though it does make me want to dye it!). My actual hair color is just a little darker than the picture above! Beautiful, vintage perfect, love everything from gown to styling. What great fabric! I love those awesome unexpected finds! I have been in a major sewing slump lately; I needed this inspiration to get me going…not that Mary needs one more stitch of clothing. Her closets are bursting! It certainly looks like Spring where you are! What an adorable frock and you look nothing short of lovely in it. Great job piecing it, that really makes all the difference. Now I want to go sew a snazzy dress! You and your dress look like you just stepped out of my parent’s photo album. Delighful! CUTE!! I love the pops of red, too!!! Now I can’t wait for spring, either! Lauren, I love to see your newly-made getups. I love loud and crazy prints too so this is totally my taste. You look great, and that dress is adorable. Fantastic!! I love how the red pattern frames the collar; you did a great job lining everything up. I’m more of an early 30’s girl (the later year seem so ‘lean’ and I’m not! ), but this dress has just wonderful style! Thanks for making it up so we can see what it really looks like compared to the envelope illustrations. On top of everything else, I love how you’ve worked the geometry of print around the collar! This is so cute! I’m not as brave about fabric choice, but your choice turned out phenomenal! Oh wow! This is so beautiful. It looks fantastic. Wow, that’s… wild. ;) Good job with the stripes, it’s quite flattering! And I LOVE your hair – I’ve GOT to learn how to do curl fluff on the top of my head! What a stunning dress, and you model it so well! For some reason only a French expression comes to mind (and it’s not my native language): génial! 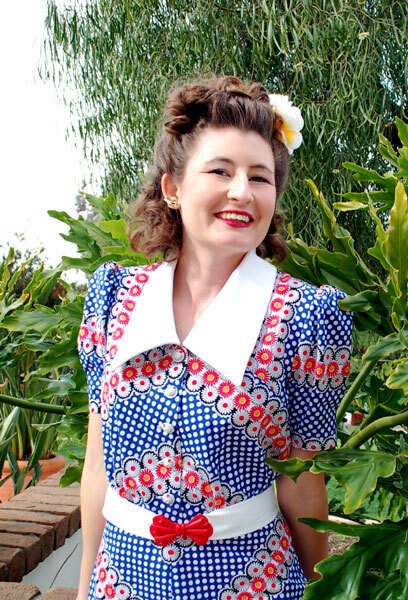 The dress is lovely – I especially adore your attention to detail with the collar following the pattern perfectly – but the entire outfit all together is truly superb. Wow, really fun dress! As always your styling is the best… and I love those earrings. Such a Joyous dress- really very lovely indeed! Beuatiful I love diagonal stripes and checks, unfortunately we have 6 inches of snow at the moment…. so still in several layers of wool here. What a gorgeous dress. I want one like that. The patterns really add something to the effect. Oh my goodness–you look gorgeous, Lauren! :) Wow. I’m just so in love with this dress and colors. Plus I want to steal those earrings! ;) hehe. Bravo on another inspiring project–you never cease to amaze me! You look amazing! I love how the stripes/prints line up. I’ve wanted to do a chevron print dress forever…and it takes the right print as you’ve found. And you need oodles of fabric to get the lay out just right. And you did. Wonderful…it’s very sweet that Olivia De Haviland, pictured on that Hollywood pattern, is still alive! Oh my goodness, this dress has stolen my heart! I absolutely love everything about it!!! LOVE this dress! What a fantastic printed fabric to use with this pattern! I’ve been dying to see the dress ever since I saw the sneak peek on Facebook! Another fabulous creation! Wow, that’s really beautiful! Wonderful job. That is so cute, and awful in the best possible way. I love the play with stripes – its so clever and cunning.